Does your back pain due to sitting or standing for long hours? Do this simple yoga exercise anytime, anywhere and be free from back pain in just five minutes with All Direction Back Stretch! How To Do The All Direction Back Stretch? You can comfortably practice this yoga exercise for back pain anywhere as a part of office yoga on your chair at the work desk, airplane yoga, in front of your television during a break or on the yoga mat. 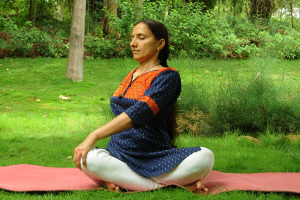 Sit comfortably in Sukhasana (cross-legged pose). Keep your back straight and shoulders relaxed. Most importantly, smile. If you prefer to practise these yoga postures while standing, keep your feet parallel. Breathing in, slowly lift your arms up from the sides. Interlace your fingers so that the thumbs touch each other gently. Stretch up as much as you comfortably can. Keep your elbows straight and ensure that your biceps touch your ears. Hold this posture for 2-3 long deep breaths. Tip to deepen the back stretch: Gently pull the navel (inwards) towards the spine. Your fingers continue to remain interlaced above your head. Breathing out, gently twist to the right side. Hold this position for 2-3 long breaths. Inhale, come back to the center. Exhale, turn to your left side and again hold this position for 2-3 long breaths. Inhale and return to the center. Exhale and slightly bend to the right side. Hold and keep breathing. Breathe in and come back to the center. Exhale and bend a little to the left side. Ensure that you are not bending to the front or back, and that one hand is not stretched more than the other. Breathing in, come back to the center. Tip to deepen the back stretch: Engage your abdominal muscles during the stretch. Breathing out, stretch your hands out to the front. Breathe in and as you now breathe out, stretch forward from your lower back. Breathe in and as you exhale, turn to your right side. Ensure that both the hands are parallel to each other and stretched equally, else gently correct the posture. Breathing in, return to the center. Exhale and repeat the stretch, turning to the left. Return to the center as you breathe in, and slowly bring your arms up. Unlock the fingers and stretch back. Inhale and come back to the center. As you exhale, slowly bring your arms down from the sides. How this back stretch helps? Gives a nice massage to the lower back. Keep your left palm on your right knee. Take a deep breath in and as you exhale, slowly twist to your right side. You may keep the right hand on the floor beside your right hip. Stretch upward by pressing the right palm on the floor. Do not lean back or forward. Exhale and repeat the stretch on the left side. Keep your right palm on your left knee and left palm on the floor. Remember to keep your back straight and stretch tall. Change your cross-legged position. If your right leg was placed over the left, now place the left leg over the right and repeat the stretch as explained above to the right and left sides. Tip to deepen this stretch: Engage the abdominal muscles in addition to the hip muscles to twist further. Note: We strongly advise those suffering from slip disc to practice yoga postures to relieve backache only after consulting their doctor. Practice yoga postures at home after learning it under the guidance of a Art of Living Yoga teacher. 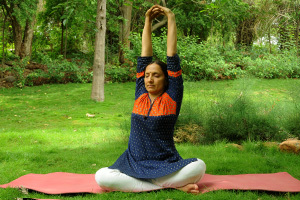 Inputs by Dr. Sejal Shah, a Art of Living Yoga teacher, the All Direction Back Stretch yoga exercise strengthens and stretches your back muscles in all possible directions, offering a complete workout for a healthy spine. Additionally, this yoga exercise also works out the abdominal muscles. Feeling held back due to a physical ailment? Are emotions taking a toll on your personal and work life? Fill in the form below to learn more about how yoga can aide you in overcoming issues naturally with minimum lifestyle changes.